The financial crisis saw a large number of firms suffer huge losses through a manual and disjointed approach to approving credit. Fast-forward to 2016, and things have shifted substantially. Government regulatory changes have demanded innovation – and marketplace lenders have risen to the challenge by using predictive modeling, data aggregation, and electronic payment technology to assess the financial health of consumers and small businesses. But these innovations don’t just help with compliance; new lending tech dramatically improves the customer experience by demonstrating that a lender truly understands the consumer’s credit needs. To this end, the industry is moving toward developing a single, unified view of the consumer – incorporating personal, transactional, application, and product-selection data collected from financial institutions – and using this data to perform rich analytics and needs assessment for borrowers. So armed, new-age lenders can leverage this alternative data to cross-sell other credit products at key decision points during the loan-application process – a win-win for both borrowers and lenders. Join us on February 24th at 10 am PT/1 pm ET for an animated discussion on the trends driving change in lending and credit risk management. 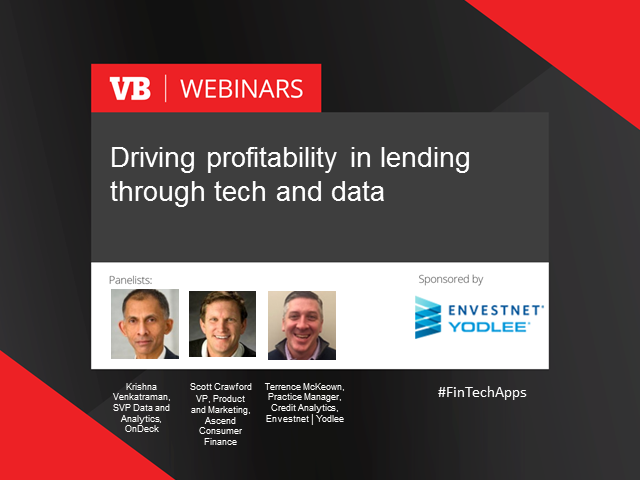 Learn how to leverage new technologies and data analytics to improve credit decisions, collections, and portfolio management.